Knuckleduster has been working on Gunfighter's Ball for a while now, and they're just about ready to unleash it upon the crowdfunding world. The game takes place in the Wild West and gives players rules for creating their gangs of lawmen or desperados or various other gunfighters and have all manner of shootouts. The Kickstarter will have the rules for the game, as well as various game aids, terrain, and exclusive figures. It will launch on November 1st. 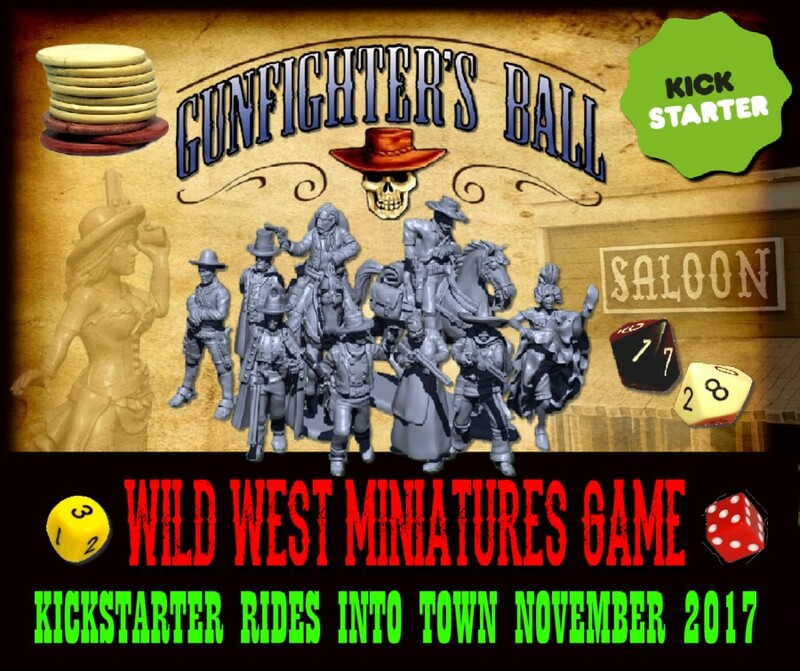 Knuckleduster's long-awaited Gunfighter's Ball game system is ready for Kickstarter! Updates will go out on Facebook and through our Gunfighter's Ball blog. This tabletop miniature game is a free-wheeling, intuitive tabletop game for multiple player pickup games where the fun of having a wild and wooly shootout where anything can happen takes precedence over the confines of point-based tournament-style play. The system has inherited much of the feel of Desperado, Tom Kelly's classic Western game from the 90s (which Knuckleduster currently produces), but with streamlined mechanics and new rules for things like quickdraw contests, fanning, and called shots. Advanced rules and cards give options for players who want a more challenging stye of play. At all levels, the game does what Desperado always did exceptionally well: combine the freedom of roleplaying with the turned-based excitement and clear boundaries of tabletop skirmish games. *Expanded terrain selection, with our signature multi-media mdf/metal/resin kits, which are finely detailed but extremely easy and quick to assemble. *Exclusive minis and resin detail kits. We go live the first of November!